Davis Bitton has made a name for himself designing up-style and upscale hairdos for special occasion wear. Following the major trends of the coming season, his collection is a study in classic looks. 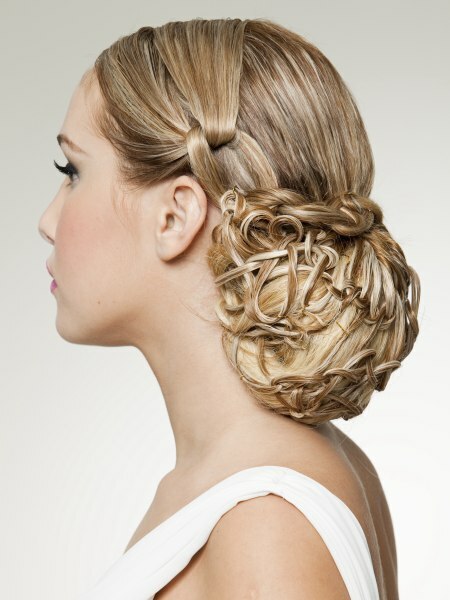 These updos range from the soft and romantic, to the intricate and detailed. The hairstyles all feature clean lines and precision styling which reveal Bitton as a true master of his craft. The collection takes a small sample of themes and explores them fully, showing how subtle changes in the looks results in dramatic differences in the visual impact of the hairstyle. We'll see pretty princesses and silver screen sirens, with a smattering of delicately detailed debutante thrown in for good measure. No matter what kind of look you favor, there's something that will make you want to put your stylist on speed dial. What every woman wants on a special day is a tiara. And when the diamond-crusted kind isn't appropriate, the next-best thing is one made from silky-golden strands woven together. The golden braid makes a beautiful coronet to hold back the foreground locks in the loosely-curved arrangement of this updo. The simple, clean lines enhance the bump at the crown and provide a perfect origin for the fall of cascading curls that spill forth over the shoulders. It's a glamorous and romantic hairstyle without being fussy. What more could you want? Another special day with a slightly different demeanor; this hairstyle features smoothed foreground captured in a circlet of filigreed golden silk. 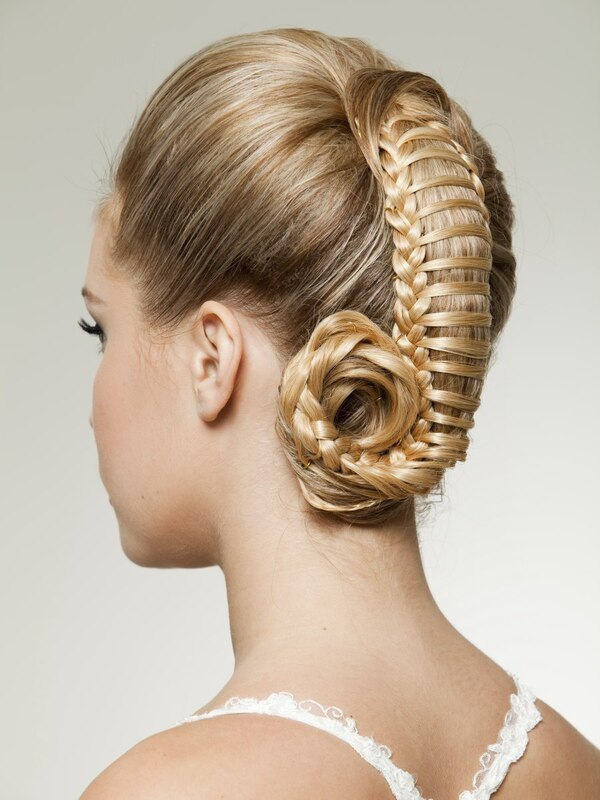 While similar to the first up-style with a braid, this one is slightly more dramatic and sleek. The styling transforms the cascade of curls into a veil of silken tresses that frames the face beautifully and makes certain that all eyes are on you. Here we see the elements of up-style two transformed. This look is for the woman who wears her hair - and is never worn by it. The intricate filigree circlet accents the top crown sections, while the previously loose veil is wound into a knotted, over-the-shoulder tail, whose end spills softly down the chest. The hairstyle brings a juxtaposition between detail and control, and soft romanticism. This is a woman in control, who knows what she wants and what looks good on her. Simple, soft, flirty and playful, are all words that perfectly describe the updo shown here. The loosely-curved lines that emanate from the off-centered starburst parting gather at the back of the skull and then explode into a shower of golden streamers. The woman with this hairstyle loves to feel: the sun on her face, the wind at her back and the bounce of her curls stroking her shoulders. She doesn't go for a lot of fuss and bother - just simple beauty. I look at this up-style and my first thought is this is a Disney princess come to life. The softly-swept fringe with the off-center parting is separated from the crown by a thick, golden circlet of hair. The foreground tresses are incorporated into the rear of the style at the center back and then allowed to spill in swirling spirals of smooth silk. When you see a woman in this hairstyle you find yourself automatically looking for the pumpkin coach or magic carpet that is surely waiting nearby. Of course, beauty comes in as many flavors as ice cream, and here we see an up-style that is certainly NOT vanilla. This carefully crafted hairstyle calls to mind images of Veronica Lake, but with iron-clad control. The style takes the concept of "fall of curls" and stands it on its ear by sculpting a collection of coils that combine visual interest, clean lines and do it all without sacrificing glamour. Who says up-styles are boring? This transformative updo takes the otherwise long tresses, and through careful sculpting creates the impression of a shorter, sassier and sexier look. The image here calls to mind a young Rosemary Clooney. The hairstyle features a softly-side-swept fringe with waves that are then woven at the nape into a knot of soft, curling coils. The effect is classically elegant without being too formal. 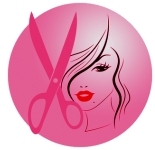 This "princess look" takes the side elements and pares down the mass of the hair. Instead of the great rope of knotted tail draped across one shoulder, the tresses are twirled into a froth of curls and allowed to spill down the side of the face. The look is just as dramatic, and gives a softer, more-playful air. This up-style takes its cues from the smoother side of styles. The forelocks are swept across the forehead into a smooth wrap that is framed by the herringbone braid resting at the front of the crown. At the back of the head we have an elongated bun style with softly-sculpted coils nestled inside the border of twisted tresses. The look is at once elegant and formal, without being too fussy. It is a look that seems to say you've spend time to look elegant, but that you aren't pretentious about it. Inspired by the classic snood, the artist has created the same look using the model's own hair. Note the elements of smooth styling in the top, sides and crown of the head, with the simple knot on the side at the top of the ear. The hair is then gathered and apparently confined in a basket woven from slender strands of hair. This silken snood is filled with gentle coils of hair creating a classical, elegant silhouette. A simplistic French braid seems truly childlike when compared to this incredibly sculpted and carefully woven up-style. Gathered to the center crown of the head with volume in the hair, the remaining locks are carefully sculpted into a design resembling a ponytail captured within a net. The woven shape ends up in a coil at the nape. The style is finished impeccably and is perfect for any elegant event. While many of our other "coroneted" looks call to mind the princess in every young woman, this is not a hairstyle for a princess. This up-style is for she who would be "Queen". The smoothed-back foreground is confined in a double border of silky golden braids which are conjoined by swirled half-loops of golden filigree strands. The remaining hair is shaped into a coif which recalls the Elizabethan Age where - while few women in the world held any power - the most powerful person in the world was a Queen.